1. In a frying pan, heat the oil over a low heat. Add the garlic and chilli and cook for 3 minutes, or until softened. Add the tomatoes and spinach; season. Cover the pan, turn the heat to high, and cook for 7-9 minutes, until the spinach has defrosted. Meanwhile, cook the pasta in boiling water following packet instructions. Drain, reserving 150ml (1/4pt) of cooking water. 2. Remove the frying pan from the heat and stir in the cream cheese. Add the pasta to the pan with a splash of cooking water; this will give you a glossy sauce. 3. Toss the pasta with the sauce, adding the reserved water to loosen it. Season to taste and serve with a green salad on the side, if you like. If pasta is involved, you can always count me in! 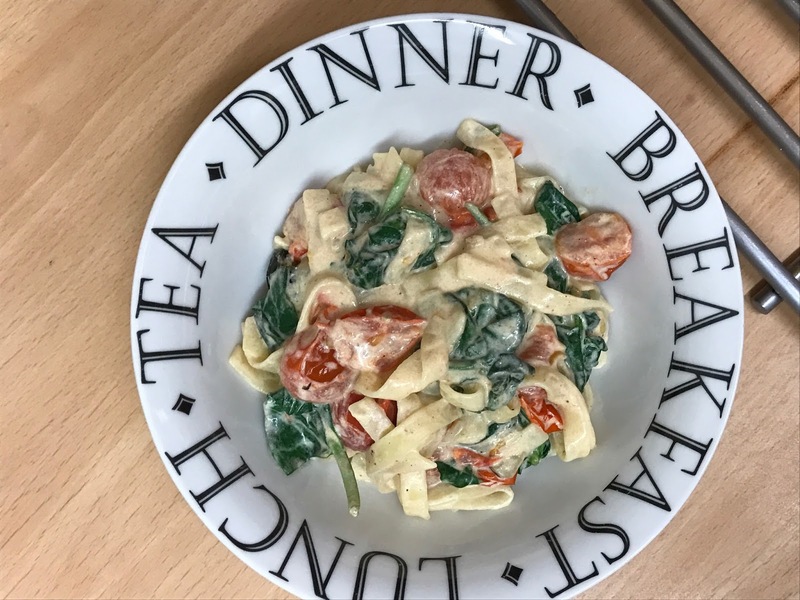 I love creamy pasta, so this is right up my street. Another one of your recipes I'll have to add to my bookmarks for later! This looks soooo good!! You know pasta is my thing and spice well that just tips it to the edge!! I have to make this! !